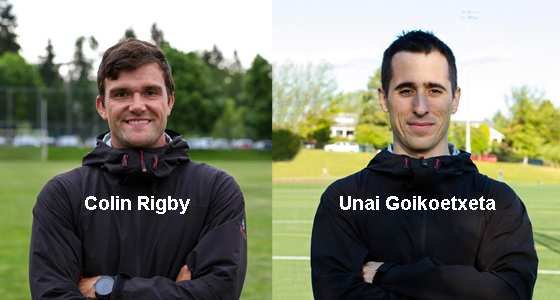 (May 15, 2015) As part of the EYSA Futures initiative, EYSA welcomes two new Technical Directors, Unai Goikoetxeta and Colin Rigby, to improve the soccer experience of all our players. The two are development assets for use by all EYSA clubs, and will focus on coaching both players AND coaches alike. Obviously, a job like this requires not only soccer skill and knowledge, but also successful coaching experience, and the duo have this in spades. Rigby played professionally in the US and Europe, and has a NSCAA (National Soccer Coaches Association of America) National Diploma. Goikoetxeta played and coached for SD Deusto in Spain (División de Honor de Vizcaya at the time, but on the brink of being promoted to Spain's third division), and has the ultimate in coaching licenses, the UEFA Pro License, making him qualified to coach at the highest professional levels in Europe. Unai Goikoetxeta waxes philosophically when discussing why he became a coach. "I wanted to show that it was possible to teach the sport in a pedagogical and human way." Coaching goes beyond teaching soccer, he explains. Coaching done right means inspring "the personal growth of each person I teach, whether a player or a coach. Being part of such improvement is what motivates me to share my knowledge and love for the game with others." Originally from Bilbao, Spain, Goikoetxeta started coaching at 19, and has coached and managed young, elite teams of all age groups (U8 to U17). He started coaching with the goal of proving that it is possible to teach soccer without following the traditional coaching methods. Today, Unai defines himself as a detail-oriented coach, and as a strong believer of human work as the key for team success. His primary goal is to educate players so they gain confidence and play intelligently and proactively, allowing them to reach the highest goals they are willing to achieve. Established in Seattle since 2014, he is willing to share his experience, knowledge, and ideas for the development of soccer in the region and the country. "I want to help define innovative ways to educate players, and to help make EYSA a role model for other clubs and associations," he explains. Fellow Technical Director, Colin Rigby, is of the same mind. "The country needs to put a stronger emphasis on player development and soccer education. I want people around the state to look at EYSA as an association that goes above and beyond for its players, coaches, families and teams. We have the potential to be the platform association which every association in the state and country can follow in the future," he affirms. "Growing up on the Eastside, I have a strong affinity for the soccer community here," says Rigby. "I am excited to work with the coaches around the eastside and make an impact in each club and community. Success will be a by-product of the work we all put in, and I am very excited to see all players, coaches and teams working hard to creating a bright future for soccer on the eastside." Rigby believes youth soccer should follow a structured philosophy that is based on developing purposeful technical skills at a young age. Soccer is a game that can teach its players teamwork, competition, hard work, creativity, problem solving and encouragement. Rigby and Goikoetxeta are proud to be in the northwest, the "soccer capital of the United States," and look forward to building an even stronger soccer base through their work at EYSA. Read more about the role of our EYSA Technical Directors, and view complete resumes.